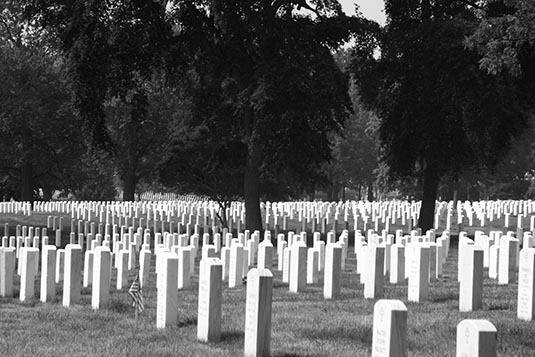 Arlington, Virginia, USA: A place to honour. A place of valour. 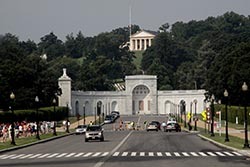 Arlington National Cemetery is the best known of over 100 national cemeteries in the US. Its 624 acres shelter the remains of over 320,000 servicemen and women, veterans from every war and major conflict in the country’s history. Irrespective of your nationality, a visit to this sacred military shrine is bound to stir your soul. I was part of the Mauiva Aircruise group touring the East Coast. It was our 6th and the final leg of the tour. Our schedule was a visit to the Arlington National Cemetery in the morning, a visit to Museum of Natural History in the afternoon and wheels-up to New York City where the tour would end. For the previous night we were at Washington Hilton Hotel. After breakfast, we left for Arlington which is in the State of Virginia, USA. Bridge on the River Potomac separates Washington, D.C. and Virginia. Before entering the premises of Arlington National Cemetery, we made a brief stop at Iwo Jima Memorial. The Marine Corps War Memorial (also called the Iwo Jima Memorial) is a military memorial statue outside the walls of the Arlington National Cemetery. The memorial is dedicated to all personnel of the United States Marine Corps who have died in the defense of their country since 1775. 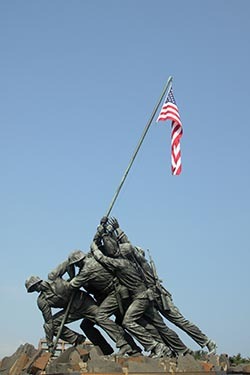 The design of the massive sculpture by Felix de Weldon was based on the iconic photo Raising the Flag on Iwo Jima, taken during the Battle of Iwo Jima by Associated Press photographer Joe Rosenthal. The memorial features the Marines and Sailor who raised the second flag over Iwo Jima: Sgt Michael Strank, Cpl Harlon Block, PFC Franklin Sousley, PFC Rene Gagnon, PFC Ira Hayes, PM2 John Bradley. After spending about 20 minutes at the memorial, we drove through the gates of the national cemetery. 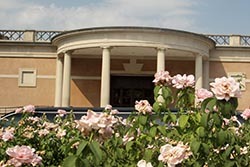 The first and a recommended stop is the visitor centre. Maps, displays and information provides for excellent orientation. The land encompassing Arlington National Cemetery was once home to tribes of native Americans who fished the neighbouring rivers and hunted in the forests. During the colonial period it became home and farmland for European settlers. George Washington Park Custis, the grandson of Martha Washington and step-son of George Washington inherited this land in 1802. Raised as the nation’s first presidential son, Custis dedicated his life to the commemoration of the first president. Between 1802 and 1818 he built Arlington House as the centerpiece of his 1,100 acre plantation. In 1831, Custis’ only surviving child Mary Anna Randolph Custis married Lt. Robert E Lee of the US Army in the front parlour of Arlington House. For over 30 years Arlington House became home to one of America’s most famous soldiers and his family. The Civil War brought dramatic changes for the people of the land. The Lees vacated their property and the federal troops occupied the estate. Later on, it became a burial ground of the dead soldiers. The memorials and monuments are interspersed with the graves of Americans. Some mark famous men like John F Kennedy. He lies beneath the eternal flame where the words “with history the final judge of our deeds…” are quoted from his inaugural address. 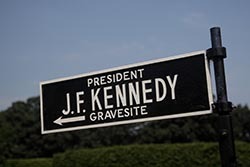 His brother Robert F Kennedy lies nearby. A heart touching ritual happens at the Tomb of the Unknowns. A sentinel of the Third US Infantry maintains vigil around the clock. The sentinel marches 21 steps down the black mat behind the Tomb, turns, faces east for 21 seconds, turns and faces north for 21 seconds, then takes 21 steps down the mat and repeats the process. After the turn, the sentinel executes a sharp "shoulder-arms" movement to place the weapon on the shoulder closest to the visitors to signify that the sentinel stands between the Tomb and any possible threat. Twenty-one was chosen because it symbolizes the highest military honor that can be bestowed - the 21-gun salute. We walked around for about 30-minutes and returned… grateful to the fallen.